On September 12,2017, Ambassador Liu Xiaoming met at the Embassy with the visiting delegation led by Chan Fan, Secretary for Transport and Housing of Hong Kong SAR Government. Ambassador Liu briefed the guests on the current development of China-UK relations, saying that this year marks the 45th anniversary of China-UK ambassadorial relations, and it is also a year for consolidating the "Golden Era" of China-UK ties. China-UK relations are maintaining a good momentum of development with frequent high-level exchanges, fruitful outcomes in pragmatic cooperation in all fields and close exchanges and coordination on international and regional hotspot issues. Ambassador Liu noted that this year marks the 20th anniversary of Hong Kong's return to China. Before the handover, Hong Kong was a historical question between China and Britain. After it, Hong Kong serves as an important bridge linking the two countries. 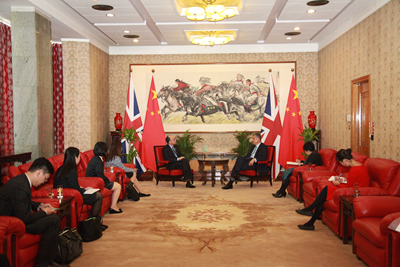 He expressed the hope that Hong Kong could seize the new opportunities brought by the Belt and Road Initiative, give full play to its role as an international financial, shipping and trade centre and actively expand cooperation with the world so that Hong Kong, the Oriental Pearl, could shine more resplendently, inject more positive energy into China-UK relations, and contribute more "golden fruits" to this "Golden Era". 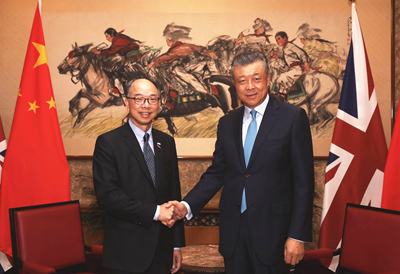 Secretary Chan talked about the maritime and transport cooperation between Hong Kong and Britain, and said that with the backing of the motherland, Hong Kong would like to make full use of the opportunities brought by the Belt and Road Initiative to overcome difficulties and forge ahead. Based on fairness, impartiality, mutual benefit, and win-win results, Hong Kong would play its unique strength to deepen cooperation in aviation and maritime transport with Britain and contribute to the "Golden Era" of China-UK ties.